It's my older boy's 13th birthday today. I made this strawberry mousse cake for him last night. We will be cutting this cake tonight when his dad is back from work. Sharing with you his birthday cake. 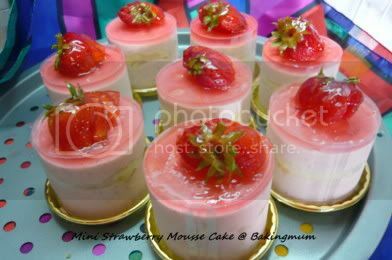 With the balance of the spongecake and strawberry mousse, I made them into mini strawberry mousse cake so that I can share it with my colleagues. (1) Put all the ingredients into a mixer bowl except cornoil and whisk till thick and pale in colour. (2) Fold in cornoil and then pour into the 9" round tray and bake at 175C for 50 to 60 mins. or till cooked. Unmould and leave to cool on a cooling rack. slice into 2 layers. (3) For Side cake: Line the tray. (4) Whisk egg yolks with sugar until thick. Whisk egg white with sugar and whisk till thick. Mix egg yolk and egg white mixture together. Divide mixtur into 2 portions. Add vanilla essence into one portion and cocoa powder into the other portion. (5) Pour batter into piping bags and pipe out diagonally into strips onto the baking tray. Bake for 10 mins. Leave to cool. (6) For strawberry Mousse: Mix strawberry puree, sugar and strawberry paste into a saucepan and warm it over a stove to melt the sugar. Then add in gelatine mixture. Leave to cool. Fold in whipped cream. Divide into 2 portions. (7) Cut slanted sponge cakes according to the height of the cake ring and place it into the cake ring. (8) Lay a layer of sponge cake into the cake ring as base. (9) Pour in half of the strawberry mousse on top of the cake then top up with another layer of sponge cake. Pour the balance mousse on top of the sponge cake. Leave in the chiller to let it set for at least 4 hours. 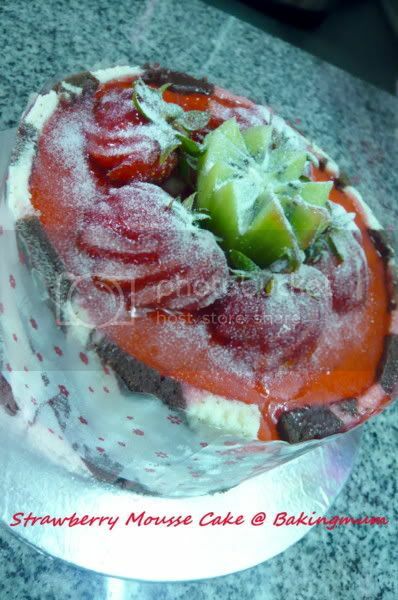 (10) Grated some strawberry chocolate on top or decorated as desired. Note 1: I used my own spongecake recipe instead of the one given here. Bring instant jelly powder, water and sugar to a boil. Add in colouring and leave to cool. (If left completely cold, the instant jelly will set so use the mixture while it is lukewarm. Happy Birthday to your older son! I like your blog, your baking is really attract me! just want to let u know i have link you since i found your blog. Happy Birthday to your ds! I am sure he is soOooOOO proud to have a ma ma that can baked him YUMMY & BEAUTIFUL looking cake. Good job! Lee. Your strawberry mousse cake(s) look absolutely wonderful. Your 13 year old is going to be thrilled! Happy B-day to your son! That is some beautiful cake(s). Looks absolutely delicious! Happy Bitthday to your son and the cake is looking great! I hope I could do this for my girl as well. Thanks everyone. So sad, my son was having fever and sorethroat on his birthday. Went to doctor and got himself 7 days mc from attending school. Actually he didn't even eat his birthday cake. Poor boy. Hi Lynn, yes you can get it from Phoon Huat in Singapore or Ng Meng Huat in JB. You can also get it from the bakery supply office called Starnet in IMM. Hi Pet猫猫, thanks for coming to my blog. Hope you get to try out some of the recipes here. Happy birthday to your son. I like the cake you bake, they are all very creative and lovely. You are talent mom! Hello Baking Mum. I always feel so inspired every time I read your blog. Could you share this recipe? I would love to try it out. 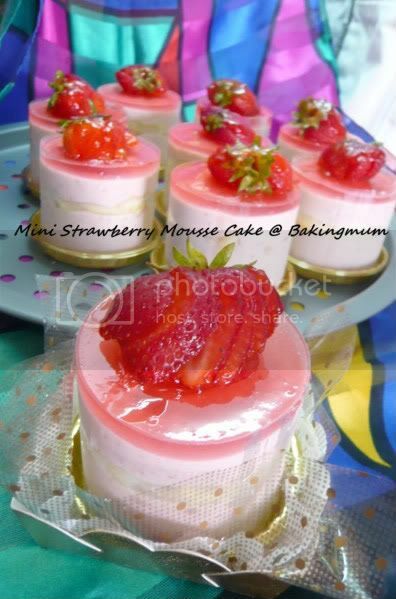 pls share the strawberry mousse cake recipe!!! It looks lovely! i have no words to describe how i am feeling..i am addicted to sweets and cakes..and visiting you site is like ...man..nothing to say!!! just love it!! !